The BHS Broadcaster | Vaccines: Helpful or Harmful? In recent years, the popularity of vaccinating children has decreased significantly. This is due to several factors, one of the most prevalent being the belief amongst parents of young children that vaccines are linked to the development of autism. Contrary to popular belief, autism is not caused by one specific factor; everyone may be diagnosed differently. Research suggests it typically develops due to either genetic influences, environmental influences, or sometimes both. Despite the recent controversy of vaccination that worried parents have created, according to the Centers for Disease Control and Prevention, numerous scientific evidence supports the statement that there is no link whatsoever between vaccines and the development of autism in children. The fact that this argument is not supported by any scientific evidence whatsoever deems it more than uncompelling. Additionally, from a logistical standpoint, it is simply irrational to deny children aid in immunity to hundreds of diseases that have killed and maimed millions of people for centuries. Clearly, an abundance of unvaccinated individuals can lead to widespread disease in communities, causing deadly, previously eradicated diseases to resurface and leading to the death and suffering of many people. Over the past decade, multiple vaccine-related factors have been examined for possible links to autism and the health of children in general. One factor includes the MMR vaccine, or the measles, mumps, and rubella combination vaccine. It is administered to children in two doses, the first given between 12 and 15 months of age and the second given between ages 4 and 6. Parents of children who developed autism around the ages of 4 to 6 claim that the symptoms appeared around the time they received the second dosage of the MMR vaccine. This claim may be true, for symptoms of autism commonly appear in many affected children around the ages of 4 to 6. Another vaccine-related factor that has been investigated for a link to autism is thimerosal, a mercury-based preservative that has been used in vaccines for decades in the US. Similarly to the MMR vaccine, there is no scientific evidence that thimerosal is linked to autism or any harsh side effects. “If thimerosal in vaccines were causing autism, we’d expect that diagnoses of autism would decrease dramatically after the chemical was removed from vaccines,” said Dr. Eric Fombonne, director of Montreal Children’s Hospital’s psychiatric division. In 2001, thimerosal was removed from all vaccines in California. Studies confirmed that autism rates in California actually increased rather than decreased after this event. Vaccines do not cause autism in children and are not harmful in any way. 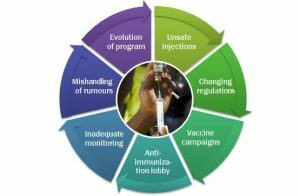 Vaccination is completely safe and necessary to assure the health of families and communities around the world by greatly reducing the likelihood of localized outbreaks and worldwide epidemics. When deciding whether or not to allow children to receive vaccines, parents must take into account their child’s future as well as the safety of other people and their community. Editor, Hansa BhargavaWebMD Medical. “A Doctor’s View: Why Vaccines Are Important « Inside Health News.” WebMD, WebMD, 11 Jan. 2017, blogs.webmd.com/breaking-news/2017/01/a-doctors-view-why-vaccines-are-important.html. Accessed 23 May 2018. Gelman, Lauren. “Health Update: More Proof That Vaccines Don’t Cause Autism.” Parents, Parents, 5 Aug. 2015, www.parents.com/health/autism/vaccines/health-update-more-proof-that-vaccines-dont-cause-autism/. Accessed 23 May 2018. “MMR (Measles, Mumps, & Rubella) VIS.” Centers for Disease Control and Prevention, Centers for Disease Control and Prevention, 18 June 2013, www.cdc.gov/vaccines/hcp/vis/vis-statements/mmr.html. Accessed 20 Oct. 2017. Mulgrew, Kylie. “Autism Linked with Vaccinations.” Kylie Mulgrew, 5 Dec. 2014, rampages.us/mulgrewkp/2014/12/05/argumentative-essay/. Accessed 22 Oct. 2017. “Vaccine Safety.” Centers for Disease Control and Prevention, Centers for Disease Control and Prevention, 27 Oct. 2015, www.cdc.gov/vaccinesafety/concerns/thimerosal/index.html. Accessed 21 Oct. 2017. “Vaccine Safety: Examine the Evidence.” HealthyChildren.org, American Academy of Pediatrics, 26 Jan. 2017, www.healthychildren.org/English/safety-prevention/immunizations/Pages/Vaccine-Studies-Examine-the-Evidence.aspx. Accessed 21 Oct. 2017.